Annually, more than 1.6 million individuals receive care in approximately 16,100 nursing facilities in the United States (Centers for Disease Control and Prevention, 2014). Individuals in nursing facilities tend to be older than 85, mostly White (70%), and described as frail and having multiple chronic illnesses and high levels of cognitive and functional impairment (Congressional Budget Office, 2013; Cox, Kloseck, Crilly, McWilliam, & Diachun, 2011; Lapane, Quilliam, Chow, & Kim, 2013). In addition to multiple physical comorbidities, approximately 50% of nursing facility residents have dementia, 11% have anxiety, and 40% have depression (Lapane et al., 2013). With the increasing numbers of older adults in the United States, there is a greater need for nursing facility services with well-trained, competent caregivers to assure high-quality care is provided in a cost-effective manner (Bonner, Castle, Perera, & Handler, 2008; Harris-Kojetin, Sengupta, Park-Lee, & Valverde, 2013). In this way, exacerbation of disease may be prevented, resident safety can be assured, and well-being can be optimized (Bonner et al., 2008). Certified nurse aides (CNAs) provide most of the direct patient care provided to older adults (Bonner et al., 2008; Walsh, Lane, & Troyer, 2014). CNAs working in nursing facilities manage tasks such as bathing, toileting, dressing, transferring, and the measurement of vital signs (United States Bureau of Labor Statistics, 2012). CNAs are essential members of the nursing facility staff and the care they provide has a significant impact on resident outcomes and quality of life. Rather than a regulated scope of practice, CNAs have to adhere to professional standards and job responsibilities. The majority of states use the Code of Federal Regulations (CFR) (i.e., 42 CFR § 483) as the unofficial CNA scope of practice (McMullen et al., 2015). The 42 CFR § 483 mandates that CNAs be trained to (a) provide basic nursing care/skills, personal care skills, and care to cognitively impaired residents; and (b) address mental health and social service needs and residents' rights. However, some states allow CNAs to provide care that goes beyond the basic 42 CFR § 483 care tasks (McMullen et al., 2015). In a recently reported comprehensive review (McMullen et al., 2015), it was found that 39 states allow CNAs to be delegated basic care tasks as per the 42 CFR § 483, whereas 11 states allow CNAs to be delegated to perform expanded care tasks. Expanded care tasks include: (a) medication administration (i.e., witnessing and documenting residents taking their medications, reminding residents to take medications); (b) wound care (e.g., applying ointments, bandages, turning and repositioning residents to facilitate wound care/healing); (c) catheter/tube care (i.e., transitioning a urinary catheter from one type of drainage system to another); and (d) managing medical information (e.g., communicating medical information given from one provider to another or to a family member, documentation of medical care) (McMullen et al., 2015). These 11 states expanded the authorized duties of CNAs with the intention of improving patient care and access to care services (State Boards of Nursing, personal communication, 2014). It was hypothesized that by expanding the care tasks performed by CNAs, RNs and licensed practical nurses (LPNs) would have more time to perform relevant assessments or other types of care activities not within the scope of practice of CNAs. Whether care provided by CNAs falls within the 42 CFR § 483 or includes expanded tasks, the delegation of care tasks is based on the delegation by the licensed nurse (Weydt, 2010). Delegation of care-related tasks occurs when a licensed professional (e.g., RN, LPN) entrusts care tasks to an unlicensed personnel (e.g., CNA) who, based on the assessment of the licensed professional, is competent enough to perform the delegated task (American Association of Critical-Care Nurses, 2004; Hathaway, 2005). Licensed nurses may be reluctant to delegate tasks to unlicensed CNAs due to concerns about patient safety and litigation in the event that unsafe care is provided; confusion regarding acceptable delegation tasks; and/or uncertainty about CNA scope, skills, experience, training, and knowledge (McMullen et al., 2015; National Council of State Boards of Nursing [NCSBN], n.d.; NCSBN, 2005; Reinhard, McDermott, Farnham, & Doty, 2011; Reinhard, Young, Kane, & Quinn, 2006; Wootton, 2000). In addition, the licensed professional may believe that delegation of care activities to unlicensed personnel may conflict with the state-based Nurse Practice Acts and other state regulations (Burger et al., 2009; Reinhard et al., 2011). Some variability exists in how delegation of care-related activities occurs and what can be delegated to CNAs across a variety of clinical settings (e.g., homes, nursing homes, assisted living facilities) (Mitty et al., 2010). This variability creates the potential of limiting care-related activities due to under-delegation or the possibility of putting nurses and CNAs at risk for practicing out of scope due to over-delegation. There is further debate among nurses and other health care professionals about what care tasks CNAs can safely manage, and what type and/or amount of training is needed for CNAs to engage in expanded care-related activities. To better understand the impact of scope of practice and allowable CNA tasks across different states, the current study compared clinical outcomes in states with basic and expanded scopes of practice. Specifically, it was hypothesized that when controlling for staffing ratios, no difference would be found in relevant clinical outcomes (e.g., activities of daily living, falls with major injury, restraint use, pain) in states with an expanded scope of practice versus those with a basic scope of practice as delineated in the 42 CFR § 483. Findings from the current study will help inform future work related to scope of practice for CNAs and the appropriate delegation of care-related tasks. The current retrospective descriptive study used data from the 2012 Minimum Data Set (MDS) as well as 2012 staffing data from the Centers for Medicare and Medicaid Services (CMS). Quality measure and staffing data were obtained from facility-level files collected July–September 2012. Staffing data from the Certification and Survey Provider Enhanced Reporting (CASPER) system (CMS, 2015a) were used as control variables. Two groups were tested in the current study: states with expanded (n = 11) and basic (n = 39) scopes of practice (McMullen et al., 2015). Groups tested were identified on the basis of prior research delineating the differences in scope of practice by state (McMullen et al., 2015). 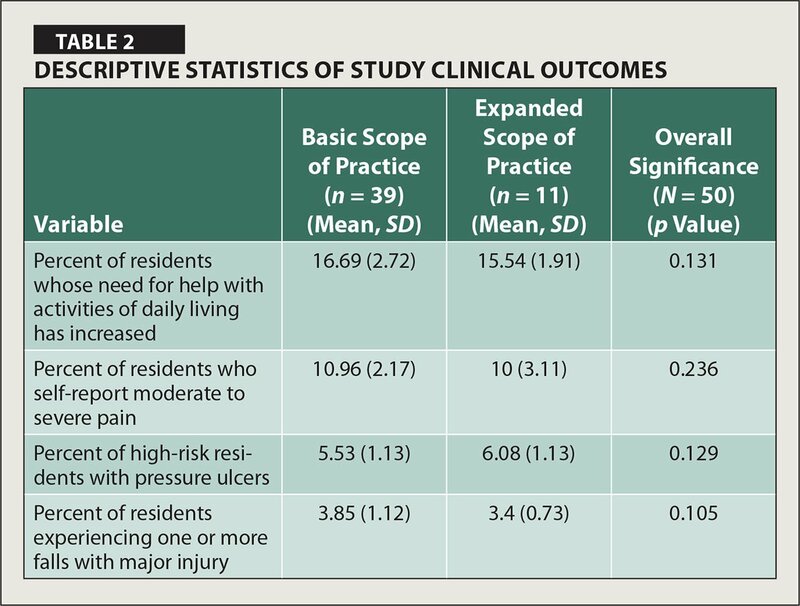 Clinical outcomes were based on five quality measures (CMS, 2013b), including: (a) percent of residents whose need for help with daily activities has increased; (b) percent of high-risk residents with pressure ulcers; (c) percent of residents who self-report moderate to severe pain; (d) percent of residents experiencing one or more falls with major injury; and (e) CNA staffing hours (Table 1). MDS is a comprehensive assessment instrument (Saliba & Buchanan, 2012) used to benchmark quality, document care needs and diagnoses, and develop plans of care, and is used as the predominant source for payment of the Medicare Prospective Payment System. MDS aids in the collection of patient-assessment quality data to evaluate functional, clinical, behavioral, and social needs of residents. The MDS assessment instrument was created to promote high-quality nursing home care through standardized, validated patient care documentation of clinically relevant data on individuals in Medicare- or Medicaid-certified nursing homes (CMS, 2013a). The MDS meets the intent of the Omnibus Budget Reconciliation Act of 1987 and includes data on more than 500 assessment items. Quality indicator scores for four outcome measures were collected for all long-stay nursing facility residents in Medicare-certified facilities in 2012. The MDS has undergone major revisions (i.e., MDS 2.0 to MDS 3.0) to increase the accuracy of reporting on quality indicators and clinical relevance of items, and to enhance resident voice in assessments (Saliba & Buchanan, 2012; Saliba et al., 2012). Prior testing provided evidence of good interrater reliability for all MDS items (Saliba & Buchanan, 2012). The pain, falls, activities of daily living, and pressure ulcers items in the MDS 3.0 were reported to have weighted kappa values ranging between 0.90 and 0.97 (Saliba & Buchanan, 2012). Validation testing for MDS 3.0 items showed higher agreement with criterion measures than that reported for the MDS 2.0 items collected for the same population (Saliba & Buchanan, 2012). Staffing data obtained from the CASPER application were derived from CMS-671 and CMS-672 forms, which detail RN, LPN, and CNA staffing hours (CMS, 2012). Staffing data for 2012 were reported on a target date and include full- and part-time employees (CMS, 2012). Descriptive data analyses were performed using SPSS version 21. Analyses were conducted on facility-level MDS and staffing data. In these analyses, a one-way multivariate analysis of covariance, controlling for staffing ratios, was conducted to consider the impact of CNA scope of practice (i.e., expanded versus basic scope) on clinical outcomes. The Wilks' Lambda multivariate test was used to determine overall differences between groups. The level of significance used for all statistical tests was p < 0.05. As shown in Table 2, 17% of residents who reported needing help with activities of daily living were from states with a basic scope of practice, whereas 16% of residents who reported needing help with activities of daily living were located in states with an expanded scope of practice. Eleven percent of residents who reported moderate to severe pain were from states with a basic scope of practice. Similarly, in states with an expanded scope of practice, 10% of residents reported moderate to severe pain. In states with a basic and expanded scope of practice, the percentage of residents with pressure ulcers was 6%. The percentage of residents who experienced one or more falls with major injury was 4% in states with a basic scope of practice and 3% in those with an expanded scope of practice. The Wilks' Lambda multivariate test of overall differences among groups, when controlling for staffing within settings, was not significant (Wilks' = 0.875, F (4, 43) = 1.536, p = 0.209). There were no statistically significant differences in any of the quality outcomes between states in which expanded tasks were allowed versus states in which CNAs practiced within a basic task framework. There were no differences in clinical outcomes between states with an expanded or basic scope of practice as determined by the 42 CFR § 483. Many factors influence clinical outcomes among residents, with CNA scope being just one. There is strong evidence that nursing home staffing and resident outcomes are correlated (Castle, 2008). Therefore, additional staffing and facility characteristics, such as absenteeism, turnover, staffing levels, care processes by staff, philosophy of care, CNA empowerment, and qualities of the facility leadership should be considered for future studies assessing scope of practice and workplace characteristics (Castle & Engberg, 2005; Castle & Ferguson-Rome, 2014; Harrington, Zimmerman, Karon, Robinson, & Beutel, 2000; Hyer et al., 2011; Kim, Kovner, Harrington, Greene, & Mezey, 2009; Rantz et al., 2004; Walsh et al., 2014). Further, medical management, underlying disease states, and disease progression of residents can also contribute to the clinical outcomes considered in the current study. States that elected to expand care practices of CNAs reported that they did so to address care issues and better identify the authorized duties allowable for CNAs (McMullen et al., 2015). CNAs managing expanded workplace tasks may offer more sufficient, safe care and may be more likely to report adverse resident events (Bonner, Castle, Men, & Handler, 2009). In addition, expanding care practices for CNAs may help free up nursing time so that RNs can provide additional resident care within their scope of practice. This additional RN time may have implications for the design and delivery of care in nursing homes (McMullen et al., 2015). One of the concerns associated with expanding the scope of CNA practice is the issue of training. Concerns have been raised that CNA curriculum training is outdated and insufficient in meeting the needs of an aging population (Institute of Medicine [IOM], 2008; Paraprofessional Healthcare Institute [PHI], 2008). Training required for CNAs only minimally prepares them with the skills needed to be successful in the workplace (IOM, 2008; PHI, 2008). Recommendations to revise training requirements have included an updated and expanded curriculum beyond the basic skills to ensure CNAs are able to provide the greatest quality of care possible (Claypool, 2009; Menne, Ejaz, Noelker, & Jones, 2007; PHI, 2012). Prior research has shown that focused training results in improved CNA problem solving, management of stress, improved caregiving behaviors, as well as higher job satisfaction (Ejaz, Noelker, Menne, & Bagakas, 2008; Menne et al., 2007; Sengupta, Ejaz, & Harris-Kojetin, 2012; Yeatts, Cready, Swan, & Shen, 2010). For example, CNAs with additional training were more likely to participate in decision making with RNs (Yeatts et al., 2010). Although not considered in the current study, it is possible that expanding the care practices of CNAs may result in improved access to care, communication among providers, and clinical and resident outcomes, and may positively affect staffing and turnover in nursing facility settings. However, as the CNA is just one component of overall nursing home staff, it is also important to assess the effects of an expanded CNA scope of practice on licensed nursing home staff. An expansion of a scope of practice for CNAs may allow more time for RNs or LPNs to manage more complex tasks for which they are trained. However, when RNs and LPNs spend a majority of their time administering medications and treatments, there is less time for patient assessment and care planning, as well as less time spent on the assessment and supervision of CNA care. CNAs may then be guiding clinical decisions with or without the necessary training or nursing supervision. For example, if care tasks (e.g., wound care, medication tasks) are expanded without the necessary nursing supervision, residents may be at risk for complications, particularly in states where CNA care practices are expanded without additional or appropriate training (Siem & Rantz, 2015). Moreover, licensed personnel may not know what tasks may be appropriately delegated to CNAs. In the 2008 report, Retooling for an Aging America: Building the Health Care Workforce, the IOM recommended improving the overall quality of the health care workforce by means of increased workplace proficiency. Although CNAs were not specifically included in this report, the IOM (2008) recommended that consideration be given to: (a) expanding workplace roles beyond the traditional roles of individuals who care for older adults; (b) increasing minimum training standards for all direct care workers (including CNAs, home health aides, and personal care aides); and (c) promoting the effective use of the work-force to care for older adults. The current study was limited by the type of data obtained during a review of state-based regulations and retrospective MDS and CASPER staffing data. It is possible that state-based regulations were subject to revisions and corrections after collected by the research team. With regard to MDS data, aggregating such a large amount of this data source may obscure differences in clinical outcomes. In addition, staffing data from the CASPER application are subject to self-report bias, as these data are collected at one point in time each year. Questions pertaining to the reliability of CASPER data have been raised (Castle, 2008). Moreover, if it is assumed that the actual role performance of CNAs varies for those who manage expanded or basic care tasks, the outcomes tested in the current study may not be sensitive to these specific role differences. The outcomes tested in the current study assess process-based quality measure outcomes rather than clinical outcomes mediated by staffing type. Therefore, with the current data sources, it may be difficult to assess if quality measure outcomes are affected by staffing case mix. To assess whether role performance alters clinical care outcomes, additional research tracking and trending care outcomes and scope of practice specifically by staffing type is warranted. The current analysis also did not include important resident and provider covariates, which may limit findings. In addition, the current study assessed CNAs in nursing facility settings. Future studies should assess whether the expansion of tasks for CNAs across other settings of care would affect care coordination and service delivery. The current study was cross-sectional and no causal inferences can be made about the clinical outcomes. It is essential to better understand how and if care, based on expanded scope of practice, improves resident outcomes. Improving resident outcomes through timely, safe, and effective hands-on care by CNAs with an expanded scope of practice may have a definitive effect on facility practices, costs, and resident satisfaction. To better understand the impact of CNA scope of practice on clinical and facility-based outcomes, prospective research is warranted. For example, in addition to the clinical outcomes previously considered, future work should consider evaluating the impact of a well-described expanded scope for CNAs on communication between providers; the work of the licensed nursing staff; and resident quality of life, mood, and satisfaction. This research could help establish the safety and use of expanding a scope of practice for CNAs. At the time of the current study, the authors were not aware of how CNA tasks were expanded in each state, whether conducted and finalized by legislative mandate or facility best practices. Future studies should assess why specific care tasks are expanded, who decides what care tasks could be expanded, and how policy and care practice decisions dictate this change. Understanding the variation in how expanded tasks were established between states may delineate, to a greater extent, the barriers to expanding a scope for CNAs, and help guide training and curriculum for expanded tasks as well as future research that assesses CNA task competence and clinical outcomes. The current study may add evidence to suggest that many factors influence clinical outcomes among residents, with CNA scope being just one. The current study also highlights the need to better understand what care tasks CNAs are capable of and comfortable with managing in a nursing facility setting. Bonner, A., Castle, N., Perera, S. & Handler, S.M. (2008). Patient safety culture: A review of the nursing literature and recommendations for practice. Annals of Long-Term Care, 16, 18–22. Cox, L., Kloseck, M., Crilly, R., McWilliam, C. & Diachun, L. (2011). Under-representation of individuals 80 years of age and older in chronic disease clinical practice guidelines. Canadian Family Physician, 57, e263–e269. Institute of Medicine. (2008). Retooling for an aging America: Building the health care workforce. Washington, DC: The National Academies Press. Public Health, 42 CFR § 483 (2015). Reinhard, S., McDermott, S.B., Farnham, J. & Doty, P. (Eds.). (2011, May29). Can consumers who leave nursing homes get help with health-related tasks at home?Proceedings from the Nurse Delegation Webinar. Washington, DC: AARP. Wootton, K.L. (2000). Determining the scope of practice for home care aides. Caring, 19, 32–35. Percent of residents whose need for help with daily activities has increased Assesses the percent of long-stay residents whose need for help with late-loss activities of daily living (ADLs) has increased when compared to prior assessment. The greater the data percentage points for this measure, the greater the prevalence of residents who reported the need for help with late-loss ADLs within a fixed data collection period. Percent of high-risk residents with pressure ulcers Assesses the percentage of long-stay, high-risk residents with stage two through four pressure ulcers. The greater the data percentage point, the higher the prevalence is of a resident who may have a stage two, three, or four pressure ulcer(s). Percent of residents who self-report moderate to severe pain Assesses the percent of long-stay residents who report either almost constant or frequent (a) moderate to severe or (b) very severe/horrible pain in the past 5 days. The greater the data percentage points for this measure, the greater the prevalence of resident reported pain within a fixed data collection period. Percent of residents experiencing one or more falls with major injury Assesses the percent of long-stay residents who have experienced one or more falls with major injury. The greater the data percentage point, the greater the prevalence of resident falls within a fixed data collection period. Nurse aide staffing hours Case-adjusted numeric number of staffing hours per resident per day of all certified nurse aides who work in certified nursing facilities. Adjusted for case mix differences based on the Resource Utilization Group (RUG-III) case mix system (CMS, 2012). After adjustment, expected hours are calculated by adding total nursing times per each RUG category and dividing by the total number of nursing home residents (CMS, 2012). Results show the expected number of hours per staff per nursing home (CMS, 2012). McMullen, T.L., Resnick, B., Hansen, J.C., Miller, N. & Rubinstein, R. (2015). Certified Nurse Aides and Scope of Practice: Clinical Outcomes and Patient Safety. Journal of Gerontological Nursing, 41(12), 32–39. The majority of states use 42 CFR § 483 as the unofficial certified nurse aide (CNA) scope of practice. However, some states allow CNAs to provide care that goes beyond the basic 42 CFR § 483 care tasks. To better understand the impact of scope of practice and allowable CNA tasks across different states, the current study compared clinical outcomes in states with basic and expanded scopes. There was no difference in clinical outcomes between states with an expanded scope of practice versus those with a basic scope of practice as determined by the 42 CFR § 483. States that elected to expand CNAs' authorized duties reported that they did so to address care issues and better identify allowable authorized duties. Many factors influence clinical outcomes among residents, with CNA scope being just one. Dr. McMullen is Analyst, Division of Chronic and Post Acute Care, Centers for Medicare & Medicaid Services, and Dr. Resnick is Sonya Ziporkin Gershowitz Chair in Gerontology, School of Nursing, Dr. Miller is Professor, School of Public Policy, and Dr. Rubinstein is Professor, Department of Sociology and Anthropology, University of Maryland, Baltimore County, Baltimore, Maryland; and Ms. Hansen is CEO, American Geriatrics Society, New York, New York. Address correspondence to Tara L. McMullen, PhD, MPH, Analyst, Division of Chronic and Post Acute Care, Centers for Medicare & Medicaid Services, 7500 Security Boulevard, S3-11-06, Baltimore, MD 21224; e-mail: Tara.mcmullen@cms.hhs.gov.